Some people say that 3D movies are a superficial gimmick that won’t last. Certainly, it’s hard to imagine any script for which three-dimensionality would be essential, but then this true of colour also. What isn’t so often noted is that 3Dness, like colour, is a pure pleasure, a pleasure in its own right, regardless of the purpose to which its put. It’s the pleasure of space itself. Hence the long history of stereo viewers, which apparently go back to 1838. The View-Master, for instance, has been a popular toy since 1939, yet there aren’t really games you can play with it, other than admire the 3Dness of the little scenes. I’ve always loved 3Dness, but I’ve been struck again by it’s importance since I’ve been thinking about drawing and, specifically, since I’ve been thinking how drawing or painting could capture something of what is lovely about Spring. 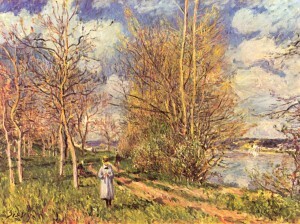 Lots of artists have already tried this of course , and some with great success (see the famous picture by Sisley below), but they are nevertheless limited by the flat surface on which they work. Look up through the branches of a tree on one of these sunny days – it’s another pure pleasure – then shut one eye. It’s still lovely of course, it’s still the same scene, but one of the things that was most enchanting has gone, the sense of depth, the actual sensory experience of it: the layers, the bounded yet open spaces between the twigs and leaves. Drawing and painting can hint at this, just as black-and-white can hint at colour, but it can’t directly capture it, while sculpture, though it is 3D, deals with solid masses rather than open spaces. Someone needs to invent a drawing app, to be used with goggles and a 3D screen, which would allow artists to reach into a virtual space and lay down lines and colours not on a flat surface but at different depths, and at whatever angle they liked. Think of the possibilities not only for capturing real scenes but for abstract images. It could be a whole new art form! I used to try to take pictures of trees in Spring, but gave it up for precisely the same reason. This is something different again, a bit like a spider’s spinneret. Incredible. But I was thinking more of a virtual drawing device, which would allow you to put dots, lines and shapes in virtual 3D space, rather than build an actual physical object with strands of plastic. I see there are 3D cameras out there which aren’t all that expensive. Previous Previous post: Eden on Earth?